New York, 20th Dec 2016 – Standard Media Index (SMI), the company providing the only complete and clear picture of real advertising cost and spend, today unveiled updated figures for November 2016. SMI total market closed November 2016 with -1% decrease on a year-on-year basis, driven by a decrease in the number of Football games, and an extremely strong November 2015. When compared to November 2014, the SMI total market for November 2016 was up +21%. NBC lost -17% in football revenue YoY. The network was the only one who had the same number of games (6) in both 2016 and 2015 and saw a +10% increase in average unit cost for the month to $720,949. It’s the 20% of inventory given as ADUs, which helped with the decline. That’s compared to just 5.2% in November 2015. CBS did see one less game in November 2016 (8) compared in November 2015 (9) – but its loss in revenue, -26% is also due to an increase in ADUs – nearly 20% of inventory in November 2016 compared to 11% in November 2015. The network also had a slight decline, -1% in average unit cost YoY. Across all three major networks with NFL games, on average, a 30-second spot would have cost $590,060. This does include Thanksgiving games, which would have cost you about a million dollars – $1,096,295 (FOX), $942,391 (NBC), and $860,095 (CBS). In November 2016, the overall TV market was down -2.4% YoY. 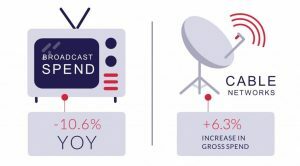 Broadcast spend declined -10.6%while Cable grew +6.3% YoY. However, when you exclude Football the national TV market is up +5.3%, highlighting how much the national pastime and live sports influences the TV industry. Similarly to the overall market, if you compare the November 2016 TV market to November 2014, you see a +8.4% two-year growth, even broadcast is up +5.2% for the two-year period. The extremely high spend from 2015 gives an unfair picture of how the November 2016 television market did. 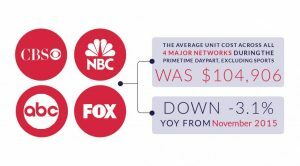 When you exclude sports, Primetime revenue fell by -8.3% across all four major networks; the average unit cost during the primetime daypart was $104,906 down -3.1% YoY from November 2015. When ABC hosted the American Music Awards on Nov. 20, 2016 the average 30-second spot would have cost you around $225,723. Though, the night brought in less gross spend than ABC’s normal lineup would have, begging the question of whether some award shows are worth the change in regularly scheduled programming. Scripps’ HGTV continues to see double digit YoY growth with a +15.1% YoY, despite a month focused on the election on football – highlighting the demand for its inventory. After nearly 7 quarters of decline, Viacom is starting to recover and deliver YoY growth. In November, the company saw a little under +10% increase on month YoY. In the last week of the election, both candidates put their national TV spend toward America’s heart – football. Hillary’s campaign spent over $2.2 Million during Week 9 NFL games trying for a last minute push. President-Elect Trump, on the other hand, only spent $1.2 Million the last week of the election. Election night is one of the only nights in history when a cable news network can bring in more for a 30-second spot than one of the big broadcast companies. Both FOX News and CNN had higher average costs for the night than CBS. “Cable continued to perform strongly with the news networks taking big dollars in the lead up to the election and the ensuing aftermath, while networks like Scripps also posted big gains as others tried to escape the election coverage,” said Fennessy. Digital didn’t fare well in the retail section either, Department Stores decreased its spending on digital by -36% and Consumer Electronics decreased spend by -34%. During the month of November 2016, digital platforms grew by +3.4% YoY – the second smallest margin of growth recorded since SMI started collecting data in 2009. Advertising on social sites (+23%) and video sites (+15%), delivered the largest YoY gains in the sector for November. The lower than expected YoY growth is due to a really high November 2015. When compared to 2014 you see a +43% growth for the two-year period. The market continues to decline due to the high spend in August for the 2016 Olympics. “Digital has really slowed in the past months and we saw another period of tepid growth from a sector that was on fire at the same time last year. We saw that major advertisers moved money into digital too quickly in 2015 and this holiday season they have rebalanced the mix to get closer to the ARF recommended split of 78% TV and 22% Digital,” noted Fennessy. The best performing digital advertiser categories for November 2016 were Food, Produce and Dairy (+52%%), Alcoholic Beverages (+26%), and IT & Software (+50%). All other media types, including Out-of-home (OOH) (-14.46%), Radio (-8.7%), Magazines (-10.6%) and Newspapers (-18.9%) saw large decreases YoY in November 2016.